Crisp, buttery, and quietly sweet. In other words, excellent. These enchanting cookies have the most wonderful crunch that really is unmatchable. You honestly don't even feel that bad eating one or two (or three or four) of them because they are so thin and delicate. It is even more helpful that the recipe only makes a dozen, as you would only be able to gobble up twelve cookies if you ate the whole batch. I hosted a surprise dessert party the summer before last for a friend who was moving to New York to pursue a career in modeling and acting. My dining room table was loaded down with cream cheese brownies, apple cake, biscotti, and other sweet morsels. The only problem was that everything was so heavy we ended up taking a walk on the bridge later that night to ease our stomachs. Looking back, I can see that something along the lines of these cookies would have been appreciated. They make you feel as if you are indulging, but they do not weigh you down. In fact, they are a bit sophisticated; I feel like I should wear a flouncy skirt and high heels while eating them. 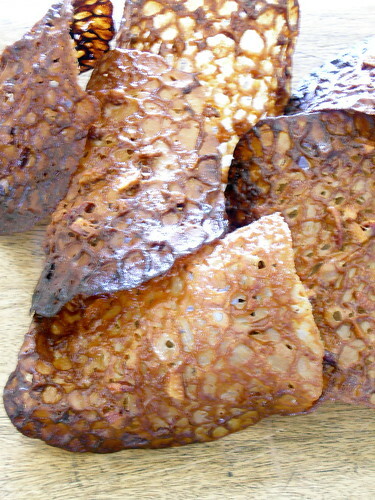 Although I like the curved shape of the tuiles, I might experiment with different shapes the next time I make these. I could see molding them in muffin tins to use as a cup for ice cream or even just letting them harden into a flat disc shape. The versatility of these cookies only makes them all the more appealing. Preheat oven to 400. Line a baking sheet with parchment paper. Melt butter, brown sugar, and corn syrup over low heat. Stir in pecans and flour. Put four spoonfuls of batter onto prepared baking sheet. Bake for about 7 minutes, rotating halfway through. Remove from oven and cool for 1 minute. 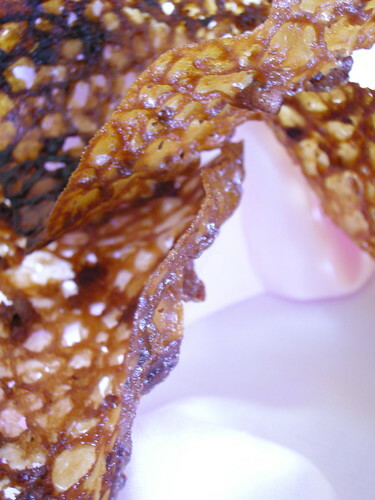 Usin a metal spatula, lift each tuile off baking sheet and drape over rolling pin to form tuiles. Allow pan to cool and repeat with remaining batter.